Shihan Gary Viccars was born in 1946 and began training in Kyokushin Karate in 1967 at the dojo of Bill Paauw in Little Ryrie St, Geelong. That dojo produced some very high profile karateka including Brian Ellison, Mervyn Nelis (now head of Seido Karate in Australia), Brian Cole, Peter Volke, Mick Varker, and Ritchie Saunders. Who would have guessed that nearly 30 years later Gary is still training in the same style and that he would rise to be one of the most prominent Kyokushin Karate instructors in Australia? 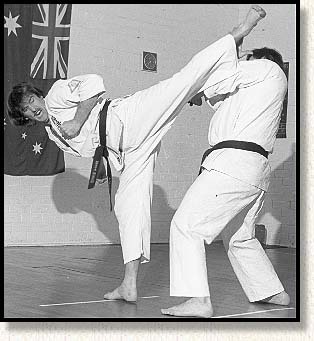 Gary has been teaching Kyokushin Karate since 1970 when he opened his first dojo at Ocean Grove as a green belt. He gained shodan in 1973, nidan in 1975, sandan in 1979, yondan in 1983 and in 1989 he and Nick Cujic became the first Australians to ever physically undergo a test for godan in Australia. In June 1997, he was awarded rokudan at the annual camp at Tullebudgera. In 1970 he was a member of the Geelong team that won the first ever Victorian Kyokushin Teams Championship and thus began a very distinguished tournament career that spanned the decade, both in knockdown and point system. Shihan represented Victoria a total of 8 times. He was a member of the first ever Victorian team to win an Australian F.A.K.O. Teams title (Perth 1977) as well as placing in the top 4 heavyweights in Australian knockdown in 1977 and 1978. In addition, Shihan Gary has always been recognised as one of Kyokushinkai's best breaking technicians. He earned the right to represent Australia at the second World Kyokushin Championships in 1979. He had also been selected in the Australian F.A.K.O. team for the 1977 W.U.K.O. Championships. Thus he is one of the very few people to have ever been selected to represent Australia in both Knockdown and point system. In 1986 Shihan Gary completed the 50 man kumite test with Jim Phillips, Tony Bowden, and Luke Grgurevic. Tom Levar is the only other Australian (so far) to later duplicate this feat. Gary's achievement was all the more remarkable as he was 39 years of age at the time of the test. Gary used his trip to the World tournament (in 1979) to stay in Japan for training and became the first Geelong person to do so. He trained with Sosai Mas Oyama 3 times a week plus many of the other Kyokushin legends. He also completed the notorious Kyokushin winter camp (his leader at this camp was none other than Akiyoshi Matsui) . Thus he is one of the few to have gained that indepth insight into Kyokushin Karate by living and training daily in Japan and personally training with Sosai over an extended period. Upon his return to Australia in 1980 he decided to become actively involved in judging and refereeing and rose to be an International referee during the next decade. He has officiated at many International Kyokushin events. His dojo in Geelong has always been a stronghold of Kyokushin Karate in Victoria and he has produced many fine karateka. He opened a full time dojo at The Arena which was described as one of the best Kyokushin dojo in the world. Unfortunately the building went into receivership and Gary had to move. His dojo at the Geelong Y.M.C.A. has been operating since 1987 and has the highest instructor base of any Kyokushin dojo in Australia ( 1 godan, 2 yondan, and 3 sandan all training in the 1 dojo). Recently he has expanded his dojo base and now has 4 dojo in Geelong all linked together. In 1993 Sosai appointed Gary as a Branch Chief and since that time he has worked to develop his branch. Shihan Gary has dojo is Victoria, Tasmania and South Australia. Upon Sosai's death Shihan Gary chose to align with the Japanese Branch Chief group (known as IKO(2) on this site) and he hosted that group's Australian Championships in 1996. However, the union was not a happy one and Shihan Viccars joined the group (known as IKO(3) on this site) then headed by Shihan Nobuhito Tezuka (8th Dan), Shihan Yoshikazu Matsushima (7th dan) and Shihan Hiroshi Masuda (7th an), in November, 1996. At that time a South Pacific Organisation was formed and Shihan was elected as the Secretary as well as becoming the Technical Director for Australia. Of all the people I have known or trained with over the past 27 years I don't know of any who has contributed so much, asked for so little, or worked harder for the advancement of Kyokushin Karate. My heart felt congratulations go out to you, it is a reward justly deserved and I know that you will wear it with the dignity, respect and honour befitting this high rank. It is no less than you deserve."